When you are without power only then do you realize how important it is? Wednesday around 3 AM in the morning we got an alert in the phone saying that there is Tornado warning, if you are in mobile home take shelter. After was pounding rain, around 4.30 A.M we lost our power. Hubby went to office late, and my little girl’s school was open so she went in a school bus. Whole morning there was no power; around 1.00 in the afternoon power came back then after 2 hours it went again. And powder back after 2 hours. Since you are bored without any interference of internet, I started cooking as gas was back on. 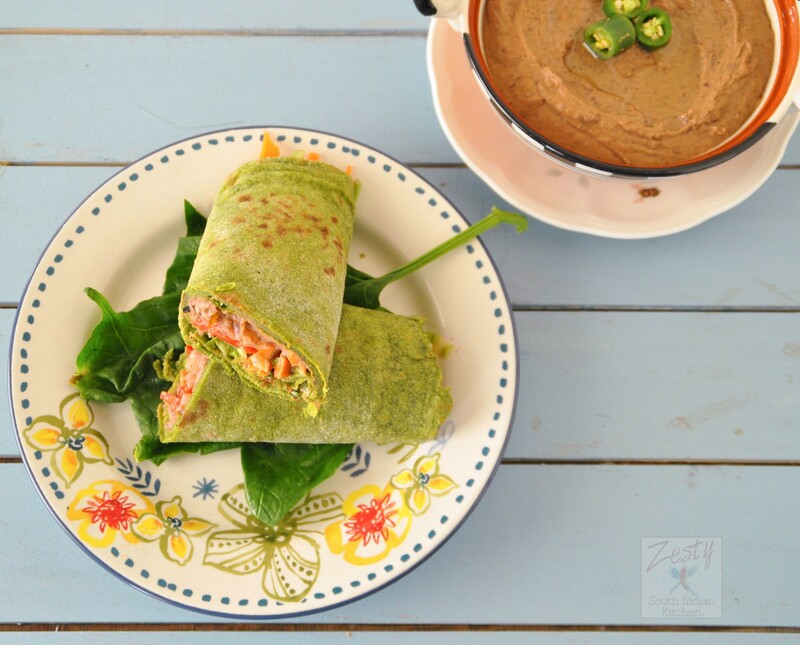 I made this delicious homemade spinach tortilla wrap with black bean hummus. First I thought of buying spinach tortilla from the market. Then skipped the idea, because of ingredients in it, and if you read you would get a shock for sure. I don’t want to keep it for long so don’t need any preservative. Then I decided to make spinach tortilla from scratch at home. I didn’t add any sugar in the recipe. Only used whole wheat flour, salt, fresh spinach, baking powder and olive oil; I know that traditional tortilla uses lard to make it. I don’t want to use it, then the choice was to use shortening, I read that butter flavored shortening works really best. I decide to go with olive oil. Since I am using fresh spinach I decide to blanch as blanching helps to clean the spinach and brighten the color. It also helps to stop the enzyme activity that causes it to eventually lose its flavor and crisp texture. Once I blanched spinach I made a puree with them. Then that puree is used to make dough let it sit for 30 minutes. While the dough is resting I made Black bean Serrano pepper hummus using Bush’s new Hummus made easy product, trust me they are just amazing. Even 6 year old is willing to finish half of the bowl then it should delicious is it. Just mix Bush’s Black beans , Bush’s hummus made easy south west black beans, Serrano pepper and hummus made easy, they have three products one is roasted red pepper, other one is south west black bean and classic. You can get it under $2 dollar in your local Wal-Mart. Once you use it you are going to hook it sure. You can use any filling of your choice I used Caramelize Onions, roasted red bell pepper, julienne carrots then lettuce and black bean hummus. I added little roasted bell pepper Italian dressing into the lettuce to make it slightly tastier. Then start making tortilla with this recipe you will get about seven 8 inch spinach tortilla. Only problem I faced since I didn’t have tortilla maker my tortilla is not exactly round as wanted. Even when I make chapathi/roti it doesn’t turned out round, still better than my earlier attempt, earlier it was like the continents of the world. Once you made spinach tortilla place south west black bean hummus on center, then layer caramelized onions, then roasted red bell pepper, julienne carrots and lettuce. Tightly warp around and completely seal them. Then slice it and enjoy my hubby told only one wrap is enough if you are too hungry you can have 1 ½. I only made filling for 3 tortillas. 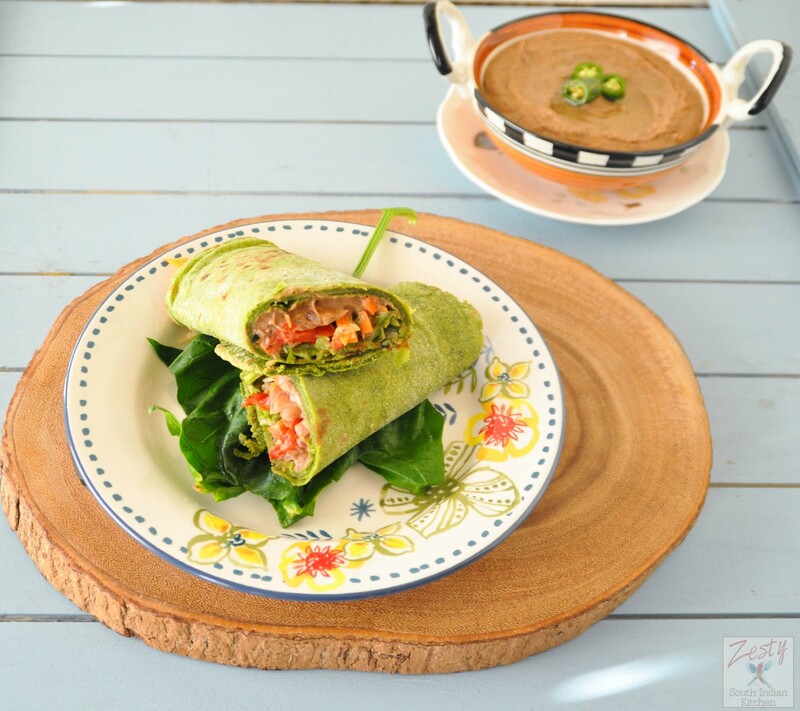 Delicious Homemade spinach tortilla wrap made with fresh ingredients and spicy Bush's south west black bean hummus. First blanch the spinach in pot of boiling water for 2 minutes then immediately transfer to ice cold water. Then blend to make it fine puree and set aside. In a kitchen aid bowl, add flour, salt, baking powder, olive oil and spinach puree and make smooth dough and set aside 30 minutes. While dough is resting make caramelized onion by cooking the onion in 1 tablespoon olive and 1/8 teaspoon salt. In small plate add Italian roasted red bell pepper salad dressing to chopped lettuce and mix well and set aside. 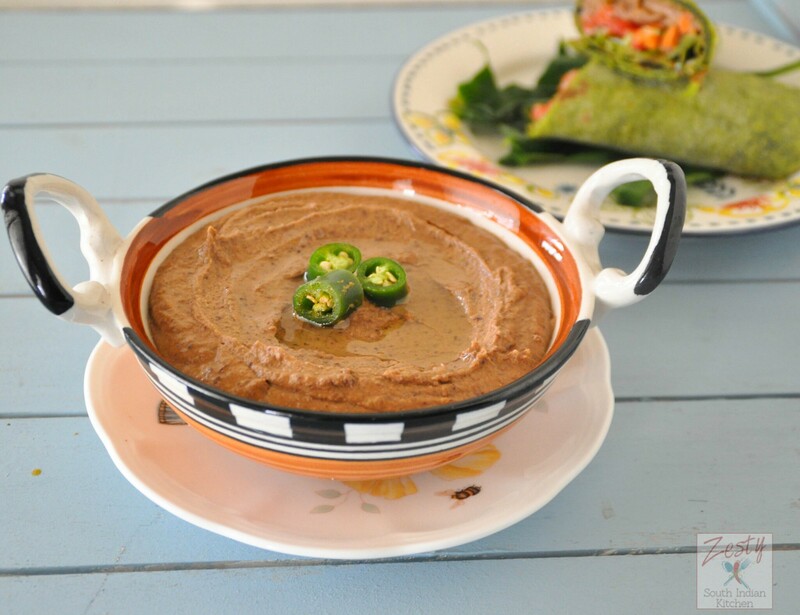 In a food processor or blender add drained washed bush’s black beans and Bush’s south west black bean Hummus made easy product and 1 teaspoon of Serrano pepper and puree well and set aside. When you are ready to make spinach tortilla, divide the dough into 7 equal rounds and dip in whole wheat flour to prevent sticking and spread it into an 8 inch round. Heat a skillet and place the spinach tortilla round you made and cook until bubbles come on the top about 1-2 minute then flip and cook for another 1 minutes. Remove from the heat and set aside in tortilla warmer or plate covered with lid. Tightly make a wrap and set aside. When you are ready to serve cut it diagonally. love the beautiful green colour of the tortillas. Great idea. wow! homemade healthy wrap from base.. Yum! 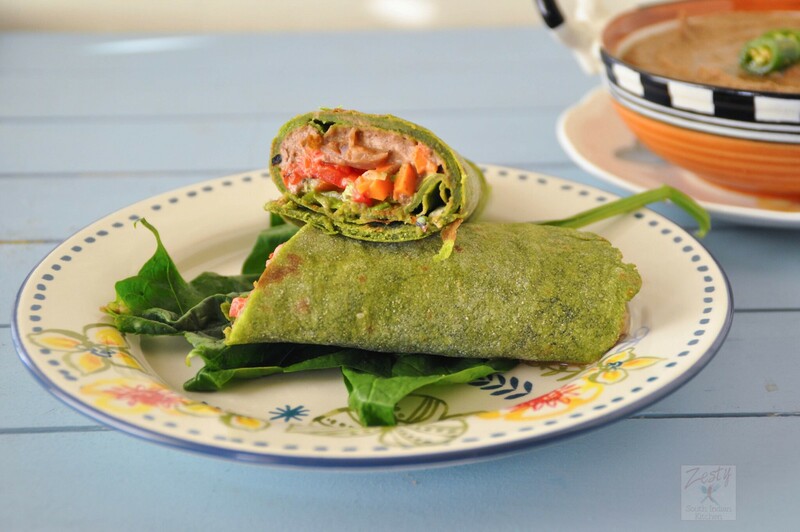 Wow thats a lovely homemade spinach tortilla wrap..Fresh and best way to have them ….I am hungry now….. I love your technique in making these spinach tortillas. 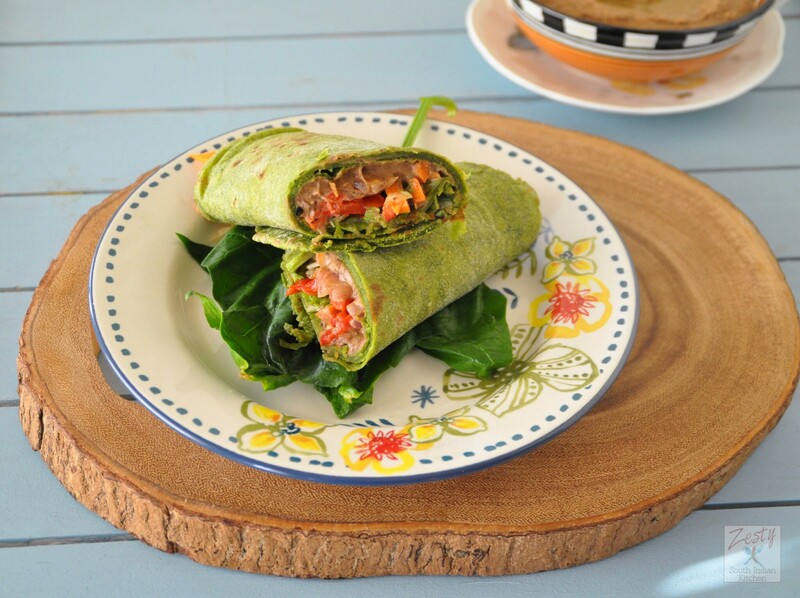 The wraps look so delicious, Swathi. Pinning, tweeting and sharing on yummly. 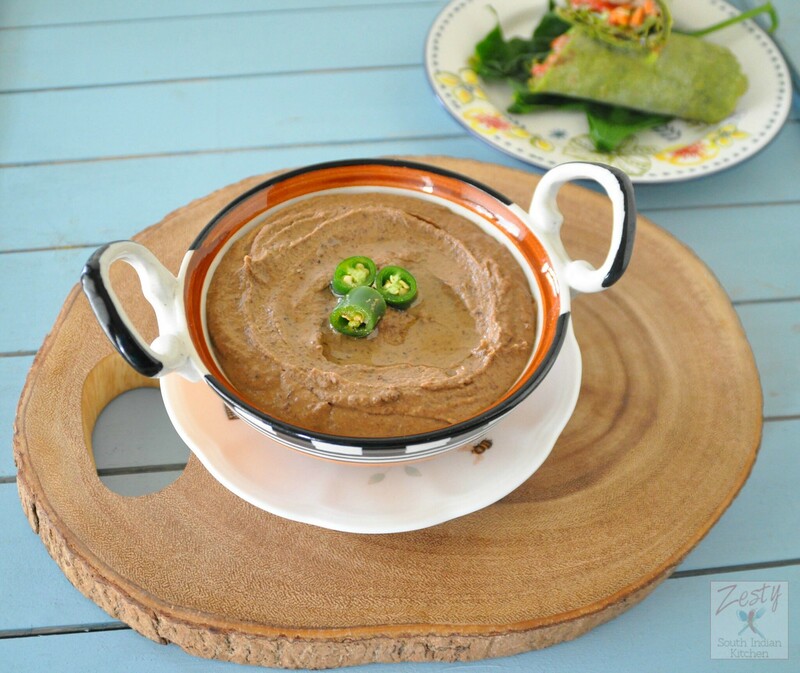 I can’t wait to try the black bean hummus! The color of those tortillas is awesome.